On this edition of the CoastLine Candidate Interviews, we meet the two people in the race for North Carolina Senate District 9. This district covers most of New Hanover County, with the exception of a small patch in downtown Wilmington, which is part of Brunswick County Senator Bill Rabon’s District 8. In North Carolina’s 9th District, 80% of residents are white, 13% are black, and the rest of the population breaks out into multiple ethnicities, Hispanic, and Asian. 36% of the voters are registered as Democrats, nearly 35% as Republicans, and almost 29% are unaffiliated. 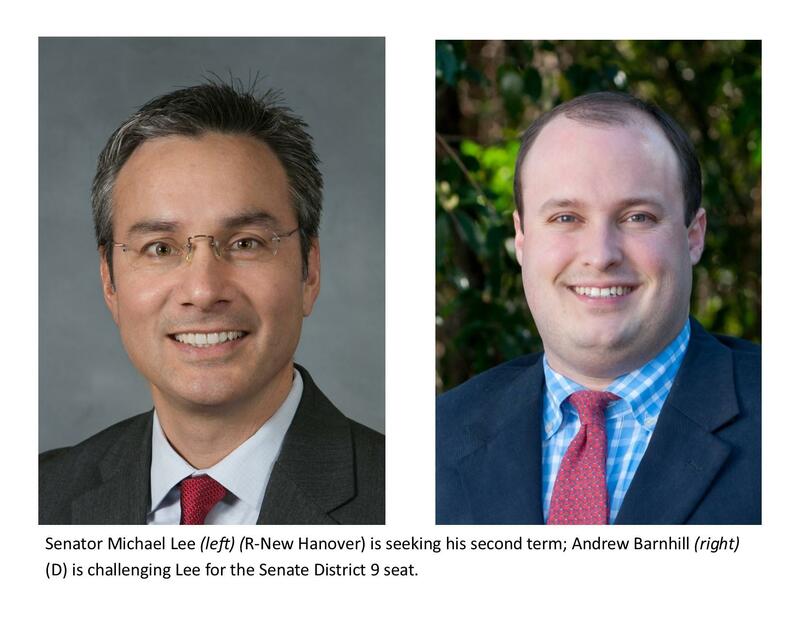 Senator Michael Lee (R-New Hanover) is seeking his second elected term. He was first appointed to replace Senator Thom Goolsby, after Goolsby resigned from his seat in 2014. Michael Lee went on to win the seat in the November election. Rachel Lewis Hilburn: Senator Michael Lee, welcome to CoastLine. Michael Lee: Thank you for having me here today. I appreciate it. RLH: Senator Lee, why don’t we start by having you tell us a little bit about who you are, what you do professionally, and why you want this job again? Michael Lee: Sure. Well, I’m a lawyer here in town. I run a small law firm. I have for several years. My wife and I have four children, ages 10 through 16, and that is where most of our time is spent outside of work and the legislative job that I have. I’m looking to run again because, in order to make real policy changes that benefit our community, it takes more than a year or two. You have to have a long-term vision and strategic plan when it comes to changes that you want to make, whether you’re talking about tax policy, education, public safety, or any of the major areas that impact us directly day in and day out. I want to build on some of the good relationships and foundations that I’ve started and continue those in the years to come. RLH: So obviously there’s a learning curve with any new job. You’ve had a little more than one term, after you appointment to Senator Thom Goolsby’s seat. What surprised you the most about the job? What did you find to be the biggest challenge in this job? Michael Lee: The most surprising thing in the Senate—and as we talk today, I’m really going to be focused on the Senate because that’s what I know the most about—but the most surprising thing is that, despite what you hear, it’s not this partisan battle day in and day out. In fact, you end up voting in a bipartisan way a very high percentage of the time, and there’s a lot of collaboration that goes on between Democrats and Republicans, mostly with senior Democrats who have been there for a very long time, those folks like Senator McKissick and Senator Blue who are both lawyers but also businessmen as well. That was really surprising to me. As far as a learning curve goes, when you start in a seniority system and you’re at the bottom, you’re really at the bottom, which is not a bad thing, but one of the things you think you have because you won an election is that you have credibility to go and do things that you want to do, and that’s just not the case. You have to build credibility. You have to build credibility with all the members, not just in the Senate, but if you’re going to accomplish anything, you’ve got to go through the House and you’ve got to have help there as well. Whether you’re a Democrat or Republican, you’ve got to build that credibility. RLH: Many of the people who wrote in wrote in on the topic of HB2, popularly known as the bathroom bill. This is something the Star News recently wrote an editorial about, talking about the stalemate between Governor Pat McCrory and the City of Charlotte. Their point is that the City of Charlotte’s ordinance is essentially moot since state statute overrides it. Governor McCrory has said, “Well, Charlotte wouldn’t budge, so it’s going to have to sort itself out in the courts.” In the meantime, there are athletic organizations, businesses, entertainers, all kinds of people who have caused North Carolina to bleed due to the enactment of this law. Where do you stand on HB2, and what would you tell your constituents about what’s going to happen with it? RLH: And now are you talking about your daughter’s expectation of privacy or the transgender person’s? Michael Lee: My daughter’s expectation of privacy or anyone that’s in that particular facility. Going back to Dillon’s Rule, as far the authority to make those rules, I think there are over 700 local governments in North Carolina, counties and cities. Imagine if you had every single municipality or county that had different rules. If we had a home rule jurisdiction, which is the opposite of Dillon’s Rule, that’s what we would end up having. So what the state did was, they came in and they essentially passed HB2. The bathroom piece of it doesn’t apply to businesses. They can do whatever they want. It only applies to public buildings and agencies. What it says is essentially that if you’re going to have a multiple occupancy facility, you have to designate male and female, by biological birth. The only thing, they struggled with the definition, so they used birth certificate because after you’ve had reassignment surgery, you can change your birth certificate in North Carolina. But they also put in the bill that you have to make a reasonable accommodation of single-occupancy facilities for those who are not comfortable in a multi-occupancy facility. That doesn’t just include transgender but if you’re taking an elderly parent or a young child and you want to go to a single-occupancy facility. RLH: Are you defending HB2 as it is written? Is this something you think we should keep in place? RLH: But can you explain how this came up recently? Because transgender people have certainly been around for many decades. Michael Lee: Sure, it came up because Charlotte passed an ordinance requiring all businesses to do a particular thing. RLH: Right, but transgender women weren’t necessarily changing in front of your daughter before this law was passed. Suddenly, there’s this big concern that there are going to be transgender people all over the place, shocking little children in locker rooms. Michael Lee: Right, I don’t think that the concern was this outpouring of folks changing in front of other people. That wasn’t the issue. This was sparked by the Charlotte ordinance specifically. The one issue that folks are talking about with the Charlotte ordinance, because it invalidated the local ordinance in total, there are other protections in there based on sexual orientation. In the people that talk to me—and I’ve met with a lot of folks, transgender people, business owners, a lot of folks—the thing that most people are upset about is because they think by virtue of HB2, you have a right to discriminate against people based on sexual orientation. That was not the intent. That certainly was not my intent. It was never a statement about any broad community of individuals. You should not be able to discriminate against someone based on sexual orientation. That’s my opinion. But that is what has been carried out and talked about, and I think that’s what a lot of folks are upset about, and that’s something that we need to fix. If that’s the perception, then we need to fix that perception because that was not the intent and that wasn’t the effect. RLH: How do you propose to fix that? Michael Lee: We’re going to have to go in and look at protections based on sexual orientation when we get back in the long session. Taylor (caller): How do you reconcile being a conservative but support a bill like House Bill 2 that removes local controls for wages? Michael Lee: Again, we are a Dillon’s Rule state. To have separate requirements in over 700 local jurisdictions makes it very difficult for businesses. Take, for example, if New Hanover County were to pass a minimum wage. You’ve got Fort Fisher. You’ve got Wrightsville Beach. You’ve got the city of Wilmington. You may have a business that’s in all of those jurisdictions and then in Pender County and Brunswick County. Minimum wage is really a statewide concern. If that is an issue in North Carolina, that is something that we really need to address at a state level, as opposed to having 600-700 local governments enacting very different rules. Caleb (caller): Senator Lee, do you not think that being a transgender person is a legitimate identity? Michael Lee: Caleb, I’m not entirely sure what that means. Have I met folks who are transgender and had great discussions and meetings and coffee with? Absolutely. I’m not entirely sure what the question is, I guess. Bretton (email): I’m a graduate of UNCW’s MPFA program. In terms of coastal resources, what new proposals have you put forth policy-wise to remedy problems such as storm water runoff, the threat of terminal groins, protecting our estuaries, and more specifically, making sure that there is truly compatible industrial development in the coastal zone? Michael Lee: One of the things that I started working on in the last session with both Senator Rabon and Senator Brown is coastal storm water reduction, which comes through beach nourishment and renourishment. The federal funds are really drying up in that area, and as hard as we have been lobbying and talking to our federal counterparts in Washington, DC, we know that we have to have a back-up here in North Carolina. We proposed three different studies for the Department of Revenue, Department of Environmental Quality, and one other agency that I can’t recall off of the top of my head to compile information so that we can make the case that we need to be looking at ways to provide for beach renourishment. It’s not only good for our economy and folks who want to come visit us and also makes us attractive for folks who want to relocate here with their businesses, but it also is a significant form of coastal storm water damage reduction when we have significant weather events that come to our area. Linn (email): I would love it if you could discuss your position on offshore drilling and protecting natural resources. From what I hear, Senator Lee is advocating to move the offshore drilling even closer to our beaches, to thirty miles. I’m concerned about the consequences this will have on our natural resources, not to mention the impact it would have on tourism, a lifeline to the coastal counties. I am very interested in learning more about the justification for this proposal. Michael Lee: We have no offshore drilling now, so I’m not sure how we would move them. Michael Lee: Oh, you’re talking about the federal? RLH: Yes. I think there’s a 2017-2022 plan, and the mid-Atlantic was removed from it. However, it’s something that a lot of people in Raleigh have been eagerly advocating for. Michael Lee: So you’re talking about the federal change that Governor McCrory worked with the federal government on. I support offshore drilling of natural gas. I’ve said it before. I’ll say it again. My qualifications are, number one, if it can be done in a responsible way. Number two, if I’m sitting on the beach with a lemonade, I can’t see the rig beyond the horizon, so there’s no visual pollution and no impact. The major concern I have with natural gas, offshore drilling— Unlike what people have stated, if you have an incident where you have a leak of natural gas, it does not wash up on the beach. It dissipates. It’s a gas. The biggest concern I have is how they’re going to get the natural gas to the coast. Are they using pipelines, and if they are, how are they going about doing that in an environmentally responsible way? To me, the pipelines that connect to the rigs are really what we need to be focusing on versus—I can’t call it a spill—but an escape of natural gas into the environment. Natural gas escapes naturally into our environment all the time. So those are some of the issues we need to focus on when we talk about natural gas. There’s no evidence of oil off the coast so I haven’t really talked a lot about that because it hasn’t been an issue for us here. RLH: If that were to come to the mid-Atlantic region—at this point, it would have to be after 2022—would there be a distinction between drilling for natural gas and drilling for oil? Michael Lee: I think so. Definitely. If you look at all the geological reports and studies, offshore natural gas is where the value is to North Carolina. When I say the value to North Carolina, I don’t mean just energy but also the royalties that would come to North Carolina by virtue of allowing people the license to mine off our coast. RLH: Wouldn’t that be something that the federal government would benefit from? How does North Carolina benefit from that? Michael Lee: North Carolina has made it very clear with the federal government that the only way that we’re going to allow offshore natural gas drilling is if the state is going to be able to participate in a royalty program like other states do. Given what the geologists tell us for the natural gas deposits, it would be a significant resource for us over decades. Deb (email): Given the link between the process of hydraulic fracturing and the substantial increase in the number of earthquakes in Oklahoma, how do you feel about the process? Do you support hydraulic fracturing? Do you feel that the proprietary chemicals should be disclosed? Michael Lee: The chemicals or whatever they pump into the ground is disclosed to the state, and the state knows exactly what it is. They don’t make that public for confidentiality purposes, but the state knows exactly what’s in that liquid. Hydraulic fracturing only applies to a very small fraction of our state. It’s nowhere near us or the coast. There’s no hydraulic fracturing that’s going on, and it’s very unlikely to occur, given the cost benefits of utilizing natural gas, which is why natural gas, a much cleaner energy source, is the one we need to be looking at and focused on because that’s where we benefit as a state with the least impact to our environment. RLH: The state legislature did open up the possibility for hydraulic fracturing in the state, and there’s a commission now, determining rules for this, is there not? Michael Lee: There is. It’s within the administration. It was opened up before my term, so I’m not super clear on the specific legislation other than they’re reviewing how it would go about if it were allowed. Sierra (caller): Senator Lee, why do you keep saying you’ve raised teacher pay like you didn’t cut education funding for classroom supplies or vote to privatize education with vouchers? Michael Lee: Yeah, so I actually brought the budget here with me because I’ve gotten this question a lot. Sierra, you’re welcome to look this up on the internet. It’s in the Joint Conference Committee Report on the Base, Capital, and Expansion Budgets under Public Education, page F4. “These increases will provide, on average, a 4% increase for educators and increase the expected salary for educators from all fund sources to over $50,150 in FY 2016-2017.” I brought the budget with me because I’ve been asked the question a lot. What that does is, it takes into account all compensation, excluding of pension benefits and health insurance. If you include that, it’s a different number. The targeted increases are supposed to get us to $55,000 in the next four years. That takes into account the pay scale for teachers on the state level, and it also includes the local supplements. We cannot know exactly what that number is until December. I haven’t put it in advertisements because of that. There are other folks, other groups that have ads out there that are not mine that talk about that. I think they’re getting that from this provision in the budget because that’s what we intended to do. We intended to get it over $50,000 in this fiscal year and then increase it further in future fiscal years. RLH: Right, and a number of different organizations have conducted their own fact checks on the $50,000 average teacher pay issue. WRAL says that outside experts suggest the claim is at least close to accurate. There are a lot of nuances here. WUNC conclusion says the recent growth in teacher salaries moved North Carolina from its low point of 47th to 41st by the end of the last school year, but this was after the first year of McCrory’s budget cuts cut teacher pay. Michael Lee: Well, I don’t think teacher pay was cut. Make no mistake, we are nowhere near where we need to be. Teacher pay was frozen in the last decade for lots of different reasons, for many years. Until 2013, it didn’t really start to climb, but the average is up more than 20% since 2013-2014. And I know everyone is not seeing that because there are different places in the pay scale where the increases have occurred. There’s been lots of increases at the beginning of the pay scale for several reasons. One, to encourage new teachers to come to the profession. Another one is when they froze teacher pay, they didn’t freeze longevity pay for the more senior teachers, so the freeze was more impactful in the first ten years of the scale. There are lot of different reasons and nuances behind this. But we are nowhere near where we need to be, and I agree that we’re behind and we’ve got to continue to work hard to catch up. RLH: A number of our listeners have asked about a campaign offensive launched by the state Republican party against your opponent, Andrew Barnhill. Some have decried it as misleading, called it negative campaigning. This is the “party boy” Barnhill allegation, which says Andrew Barnhill went on a charity mission to Africa and basically drank and gambled and partied while he was there instead of doing the work of the mission. One news organization carrying this story has been cited on these mailers. Another, the Star News, actually tried to corroborate the allegations but could not in any sort of meaningful way. What do you have to say about all these mailers and the shaky allegations against your opponent? Michael Lee: When the first one came out, I saw one in my mailbox and I called my contact with the party and said, “Stop. I appreciate the help, but I don’t want the help.” I asked them to stop. I’ve asked them several times since then to stop. I want to focus on what we have accomplished and what we want to accomplish. RLH: So you’ve told the state Republican party to stop sending these mailers on your behalf? Michael Lee: They are not. I think they’re doing it because it must work in other places for them. I don’t want it. I don’t need it. I want to focus on what I’ve accomplished. You don’t hear me walking around talking about my opponent because I want to talk about the things that are important: education, teacher pay, the pilot program that provides bonuses to third-grade reading teachers or the pilot program that pays bonuses to the teachers who teach AP and IB programs. They get a bonus for every child that makes over a certain grade. The bonus that goes to CTE teachers. Those are the things I want to talk about. I don’t want to talk about my opponent. RLH: Andrew Barnhill, welcome to CoastLine. Andrew Barnhill: Thanks for having me, Rachel. Glad to be here. RLH: Mr. Barnhill, I’m going to give you the same opportunity to start off with you telling us a little bit about who you are, your life, what you do, and why you want this job. Andrew Barnhill: Certainly, and thanks for having me here today. I grew up here in Wilmington like four generations of my family before me, so I’ve seen this community grow and change throughout the years. I went away to school and to work in Washington for a while and came back to work in ministry in the legal area here in Wilmington. Over the past several years, what I’ve started to notice is that my community hasn’t had the same sort of strong representation in Raleigh that it had for much of my lifetime. So, the past several years, as I’ve been watching the majority in Raleigh make decisions that left southeastern North Carolina shortchanged, I started being encouraged more and more to step into this and run for the state senate seat. RLH: So you were recruited? Andrew Barnhill: I was encouraged by a lot of people. RLH: Can you give us an example of one of the issues you felt did not do right by southeastern North Carolina? Andrew Barnhill: Sure. One of the things that’s standing out very strongly in this race is my emphasis on bringing back film incentives here to Wilmington. In fact, there was a news story just yesterday by WECT talking about how film is not happening here in Wilmington anymore. We attempted to develop a grant program to replace the incentive, but it hasn’t been enough to keep this industry vibrant here. So that’s been a major portion of what we’ve been talking about: building better jobs and keeping the economy vibrant here in southeastern North Carolina. RLH: As a freshman Democratic Senator, if you were to win this seat, how could you possibly turn the tide? Because this is actually one of those rare issues that united the local delegation—Democrat, Republican, it didn’t matter. Most people from this area seemed to understand how important film incentives were. So what would you do differently? Andrew Barnhill: One of the things that’s important is building relationships outside of your local delegation. I’ve been doing this since the beginning of the campaign, getting all of my Democratic caucus on board, but also reaching out to Republicans so we can build a leadership team that will fight for southeastern North Carolina. I think far too often when Senators or House members go in for the first time, they don’t take that wider view of what they can do to partner with people across the aisle and across the state. So that’s one of the things that we’ve been doing throughout the course of this campaign so that even as a part of potentially the minority party, I’ll be able to walk in the door and have those relationships from the beginning. Randy (caller): Mr. Barnhill, I’d like to ask, in regard to the statement that came out in a video that was publicized last week where Hillary Clinton said she would do away with right to work. Here in North Carolina, we are a right to work state. I’d like to know what you would do to propose that we stay a right to work state? Andrew Barnhill: We are fortunate to be in a position in the state leadership in the General Assembly to have the opportunity to keep the focus locally. I think we will continue to be a right to work state, and members of the legislature from both Democratic and Republican parties would work to maintain that while at the same time being certain we can protect worker’s rights. I think North Carolina has a long tradition of being a right to work state, and I don’t see that changing. RLH: We’ve had so many questions from listeners about the prospect of offshore drilling. For the near term, this is supposedly off the table for the mid-Atlantic. This area was removed from the federal government’s consideration until I think 2022. But what is your stance on that because obviously so many listeners are concerned about it? Andrew Barnhill: I’ve been very strongly against offshore drilling from the beginning, and I’ve made that clear as an issue in this campaign. One of the things I noticed when going around and talking to voters and knocking on doors and making phone calls to Republicans and Democrats alike is that offshore drilling and opposition to offshore drilling is something that unites us here in the district. I think it would be very hard to be a coastal representative or coastal senator and support this practice when the ocean is right outside your backdoor. Quite frankly, I’ve been surprised that my opponent has been so strongly in support of offshore drilling. Certainly, for right now, it’s off the table for the time being, but there was a recent environmental impact study that came out that showed this might be something that’s reconsidered for economic benefit in the future in North Carolina. But I think we have to continue to recognize that the environmental concerns with offshore drilling significantly outweigh any minor economic benefit that we might receive from it. Andrew Barnhill: Fracking is certainly a concern. I’ve talked with several members of the legislature, including Representative Brad Salmon, who represents parts of Lee County, where fracking has become a major issue, about this quite directly. There may be a tendency, as my opponent has said in the past, to think if you’re representing the coast, fracking is taking place so far away, it shouldn’t be a concern, but as that caller mentioned, there’s a close tie between the work that goes on in hydraulic fracturing, seismic testing, and offshore drilling that we have to make a clear stand there. I think there are numerous opportunities to search for renewable resources that will promote a clean energy future for us here in southeastern North Carolina. Betsy (email): Senator Lee did not support Medicaid expansion, citing the need for reform. As the office has always been under the administration, why on earth would reformation require this long to achieve? Our rural hospitals and some local medical centers closed. RLH: There was a study that was published very recently about comparing states that had expanded Medicaid to states that had not, and rural hospitals and medical centers were on much shakier ground financially in those states that had not expanded Medicaid. Where do you stand on that issue? Andrew Barnhill: I support Medicaid expansion and that will be something that I’ll make clear from my first day in office in January of 2017. A great case study in that is the state of Louisiana. Before the new governor was elected, the state had held back on expanding Medicaid in Louisiana. When John Bel Edwards first went into office in his first week, that was one of the initial pieces of legislation that he moved through. What we’ve seen down in Louisiana is protection for their rural hospitals down there and an increase in services for people that, prior to that, would have been struggling without health care. To me, there’s no significant reason why we would try to block Medicaid expansion here in North Carolina and help protect the lives of so many North Carolinians and so many children in particular. RLH: Where do you see the greatest opportunities for economic growth in the state, and how would you help to facilitate that growth as a state legislator? Andrew Barnhill: Certainly high tech industries are those that we see growing. Particularly here in Wilmington, the CRO industry, contract research organizations like PPD and many smaller such organizations are ones that have the potential to grow. But certainly you need an educated work force for that, and we have to balance the type of jobs that we can provide for our community. That’s why I believe strongly that the economic development strategy should really be a two-part process. One is recruiting employers to bring new jobs into the area, but also training the people who live here. RLH: And how do you recruit employers? Andrew Barnhill: Well, you provide incentive packages is one great example of that. The film incentive was a perfect opportunity to bring an industry that might not otherwise come to us here in Wilmington and New Hanover County. You, in a sense, have to be in that incentive game. We’d like to think that we can promote an environment without any tax rebates that will do that, but that’s not how industry typically works. RLH: The film incentive was its own sort of animal when it was still in as a rebate and not part of a grant fund, but there have been other kinds of corporate incentives doled out by the state that haven’t worked, and also by municipalities. In Wake County recently, there was a company that did not meet its agreements and was lobbying the county, I think, to not have to pay some of the incentives or tax breaks that they had received. Andrew Barnhill: They can certainly be a problem, and that’s why you have to have a close relationship between your municipal leadership and the corporate leadership so you can identify these problems before they accelerate. Sierra (email): The General Assembly is a large group of politicians who all have to collaborate on a budget. How would you propose a budget to raise teacher pay that could cross party lines? Andrew Barnhill: One of the first things that we need to do is recognize the faulty statements that have been made about teacher pay this year alone. I actually have with me the budget for 2017’s teacher’s salaries here in North Carolina, and I’ve looked through this pretty closely with professional educators, and we’re hard-pressed to find where the $50,000 comes from. To answer Sierra’s question, I think that in the beginning, we have to first have a conversation about what our goals are. You know, how much are we trying to increase pay? How are we going to make sure that we provide additional resources to our classrooms at the same time that we’re increasing teacher pay? I think we also need to make sure that we have professional educators at the table when we’re collaborating. Far too often, you’ll have the current Republican majority saying around election time that they want to increase teacher pay that hasn’t taken place in the previous four years to a significant level, and then teachers are left out of the equation. So I think we have to do a better job involving those educators, clarifying what our goals are, and coordinating resources between supporting our classrooms and supporting our teachers. Sarah (email): How do you feel about local control of issues like affordable broadband access and setting a local minimum wage to match the dramatic differences in the cost of living across the state? RLH: And of course, the second part of that question would be a reference to HB2, which made it illegal for municipalities to set their own minimum wages. Andrew Barnhill: Republicans will often speak about the principal that the government closer to the people is the best government. In many ways in this race, I find myself being a more conservative candidate than my opponent on that particular issue because I think local government is significant. One of the things we have lost in the discussion of HB2 is the state taking control of a municipality’s ability to regulate discrimination actions, local wages, family leave policies, all of these things that go down the chain that could be prevented by the state control we’re having here. Now, I recognize that in many ways we’re a Dillon’s Rule state, which means that the state preempts local municipalities in a lot of ways. However, we still have a lot of flexibility with our municipalities and we have to support them to make sure they have the opportunity to be the thriving cities that they should be. Bill (caller): This controversy about your trip to Africa continues to surface. Why do you think Cargo of Dreams Director Marius van der Colff has so many negative things to say about you? Andrew Barnhill: I think that’s an example of one individual who I have only interacted with on one occasion who had some negative comments. I think that’s the case with most of us. One of the things that’s interesting about this is that multiple reporters have looked into the story and weren’t able to corroborate really any of these statements that were made. I think in many ways this is just an example of a campaign tactic that’s being used by my opponent and the Republican Party in what happens to be the most competitive Senate race in North Carolina. I think it’s unfortunate when you have negative attacks made against you. That something that no one wants to happen, but at the end of the day, we have to recognize that they’re simply part of a strategy from my opponent and the opposing party in order to try to shed some doubt in a competitive race where issues seem to be the last thing they want to talk about. RLH: You talk about, on your website, the roll of faith in public life. You became a minister, according to your website, in 2009. You say you preach around North Carolina. Tell us about that, and tell us about that in the context of the separation of church and state. Andrew Barnhill: Sure, I’m a divinity school graduate. I’ve pastored and worked at multiple churches. Faith is certainly a significant and important part of my life, but one of the things I try to tell people who ask, “How do you feel about the separation of church and state?” is that I come from a religious tradition that values that. As a Baptist, Roger Williams in the 1700s fought hard to stand up for religious liberty in some of the early colonies—Massachusetts and Long Island—and it’s a tradition that I feel very strongly about. My faith certainly guides my actions. I believe strongly, as a person of faith, that we should expand Medicaid to help those who are struggling. Because of my faith, I believe we should treat all people equally and with dignity, and that’s why I oppose HB2. In many ways, my faith does guide my regular, everyday thinking, but at the same time, I’m careful not to let that dictate my positions in such a way as to alienate other people who might disagree. HB (caller): I was trying to figure out your opponent’s idea of how he proposes to put in the budget that would be acceptable to the legislature raises for teachers while at the same time having a limited amounts of funds and most of the new funds going in support of charter schools and vouchers, which takes away from local budgets and the support of the schools. Now, everybody knows you just can’t do everything with a limited amount of money. My question is how does one propose to increase the education budget and at the same time, have enough money left over for appropriate teacher raises? Andrew Barnhill: My opponent would typically make the point that the money should follow the student, and so, much of those funds should be going to allow the family to put the child into a charter school, private school, or a religious school. I would make the point that we need to fully invest in our public education system and provide enough opportunities within our public system so that all of our students can thrive. To answer the direct question about how you can budget for that, I think you have to make a choice. At the end of the day, the current leadership in the General Assembly is making a choice to move toward more charter schools, more funding for private schools rather than fully investing in our public system that has been a crown jewel in North Carolina for decades. Ted (caller): Andrew, your website says that you have a law degree. How do you plan on using your law degree to write and propose legislation in Raleigh? Andrew Barnhill: My legal background certainly shapes my understanding of the legislative process, and it helps me be aware of how to move legislation. One of my classes that I took in law school was about the legislative process, and I spent time in a law firm in a public policy department at Baker Donelson, where I worked at the intersection of law and public policy. So, it’s certainly a thread or an undercurrent that helps shape policy, but I certainly don’t think that my legal background is the only thing that would make me a strong Senator. In some ways, I think that some of my training in ministry and my experience as a trauma chaplain is something that helps me handle difficult emergencies for the people of North Carolina, that helps me listen very closely to people who are in need, and so I think any candidate brings a variety of skills to the table that certainly help them. The combination of experiences that I’ve had really does that for me. Ted (email): If you are elected, what will you do to sustain North Carolina’s recent economic recovery? Andrew Barnhill: North Carolina has had some successful recovery in many ways, which largely is thanks to some national recovery. But we’ve lagged behind in many communities, particularly here in southeastern North Carolina. So we have to do everything that we can to promote new business, to promote the small businesses that we have right here at home. But to make sure that we are taking care of working people here in New Hanover County at the same time. Franklin (email): What can be done to increase traffic through the state port, and what direct impact would that increase have on New Hanover County? Andrew Barnhill: Certainly, changes to the state port have been in discussion for a number of years now. We’ve been working to try to increase the capacity for our port here, which is certainly a vibrant aspect of our local economy. But we’re going to have to continue to monitor that closely and talk with the Ports Authority about what the best action plan is for us to be competitive with some larger ports up and down the eastern seaboard. RLH: You worked for Congressman Mike McIntyre at one point. What were your responsibilities? Where were you, which office? What did you learn from that experience? Andrew Barnhill: I was in the Washington office and I learned a lot about the people of the 7th district of North Carolina and what matters here in southeastern North Carolina. The most important thing that I learned is how to work across the aisle. One of the things that I learned from McIntyre that really stood out about him was his ability to keep the concerns and issues of this community first. I think too often we tend to focus on voting for the party or voting along with our caucus but lose track of what matters here at home, and that’s been one of my chief criticisms of my opponent and one of the things that I plan to pay attention to when I’m in Raleigh. Trey (caller): How do you plan to reach out to voters? Andrew Barnhill: That’s something we’ve been doing over the course of the past year and a half now. We have a strong field program where we talk to voters directly on the phone and in person, but one of the things that I’m proudest of is our program called Sweet Tea & Politics, which allows me to go into homes in different neighborhoods where a person will invite several of their friends and neighbors to their house, and I take questions and listen to what their respective concerns are. It’s been a great opportunity for me to see all the differences throughout our district and what truly matters more than what we’re just seeing on the news on a nightly basis. We’re also doing a series of town halls that allow me to answer a wider range of questions than we would have otherwise. Dana (caller): I’m sure you’re aware that environmental conservation funds have been gutted locally and throughout our state. What are your plans to ensure funding gets back on the table for environmental conservation? Andrew Barnhill: Certainly as a coastal senator, that will be something that’s very much at the top of my agenda when I’m in the North Carolina Senate. One of the first things to do is to partner with our other coastal representatives and coastal senators to make sure that we’re paying attention to the major environmental concerns. We’ve talked about offshore drilling earlier in the show, but that’s not the only thing. There’s a wide range of concerns that will continue. I will continue to develop councils of local community members who are well-trained in those areas. We started that with education and higher education, with veteran’s issues, and we want to continue to bring that to the forefront with environmental concerns. I’ve met very closely with our soil and water conservation supervisers to talk about what they are doing and what their concerns are for the area. So I think keeping that open dialogue and making sure that we are bringing coastal issues to the forefront in Raleigh. RLH: You sort of addressed the idea of dealing with partisanship and working across the aisle when you talked about your time in Mike McIntyre’s office, but this is a legitimate question: How do you do these things when we’re talking about such a polarized atmosphere? We have a super majority. Jessica (email): There’s bad blood in Raleigh these days. What most North Carolinians don’t recognize is that most people agree about most things. It is only on the edges where we disagree. What ideas do you have, specifically, to try to bring bipartisanship and cooperation back to the legislature? Andrew Barnhill: I think you have to find the people who are united on specific issues. So whether it is a senator in Raleigh who is really concerned about higher education and happens to be a Republican or a Republican senator from the coast who is also concerned about offshore drilling, you find particular issues and build partnerships there. I don’t think you can expect to get across-the-aisle support on every single issue, so you have to be strategic about it, and I think that takes listening to people’s backgrounds and stories what their motivations are and then developing partnerships. On this edition of CoastLine, it's a Political Reporter Round Table. We’re tackling the issues that will shape your decisions this November – as well as the unorthodox election season and how that’s playing out in local and state races. Before the presidential campaign even started, we witnessed gridlock on Capitol Hill that, at one point, quite literally shut down the government. During this presidential election season, we’ve watched month after month of political surprises and levels of division that pundits declare unprecedented. Books are written on the battle of ideologies and willingness to compromise is positioned as weakness. One well-known NPR political commentator compared the heightened vitriol to pre-Civil War era dialogue. 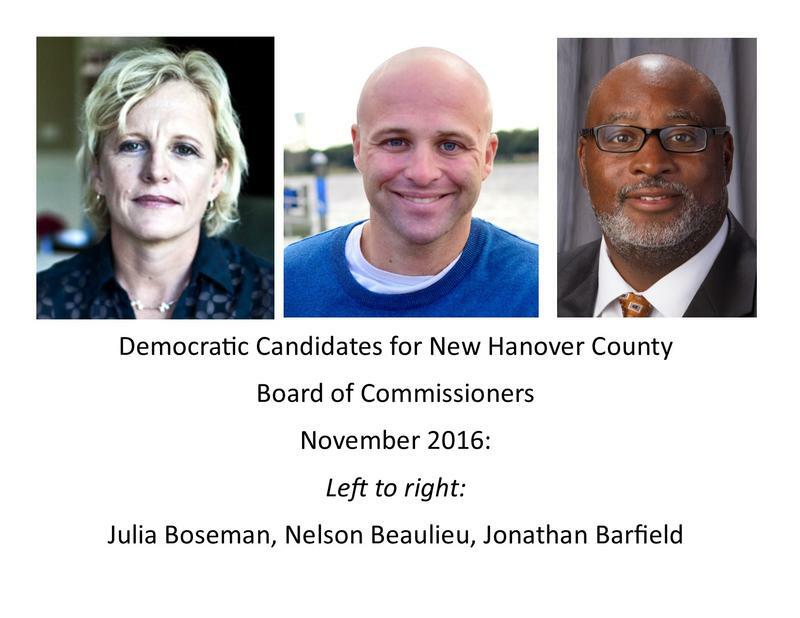 New Hanover County’s Board of Commissioners has three open seats this year. 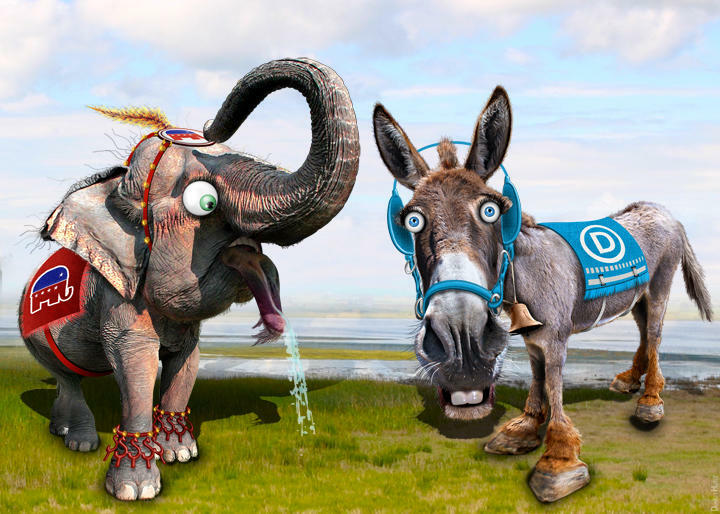 Here are the three Republicans vying for those spots – which carry four-year terms. New Hanover County’s Board of Commissioners has three open seats this year. On an earlier edition of CoastLine Candidate Interviews, we met the Republicans. On this edition, we meet the Democrats vying for those spots – which carry four-year terms. As of last year, the U.S. Census Bureau estimated New Hanover County’s population to be a little over 220,000.